The 6 th IEEE International Conference on Consumer Electronics – Berlin (“ICCE-Berlin”) has been held from the 5th to 7th September 2016 in Berlin in parallel with the IFA, the leading trade show for Consumer Electronics and Home Appliances. The ICCE-Berlin is the European sister conference of the IEEE Consumer Electronics Society’s flagship conference “ICCE” held annually in Las Vegas in conjunction with the Consumer Electronics Show. The final program is available THROUGH THIS LINK. 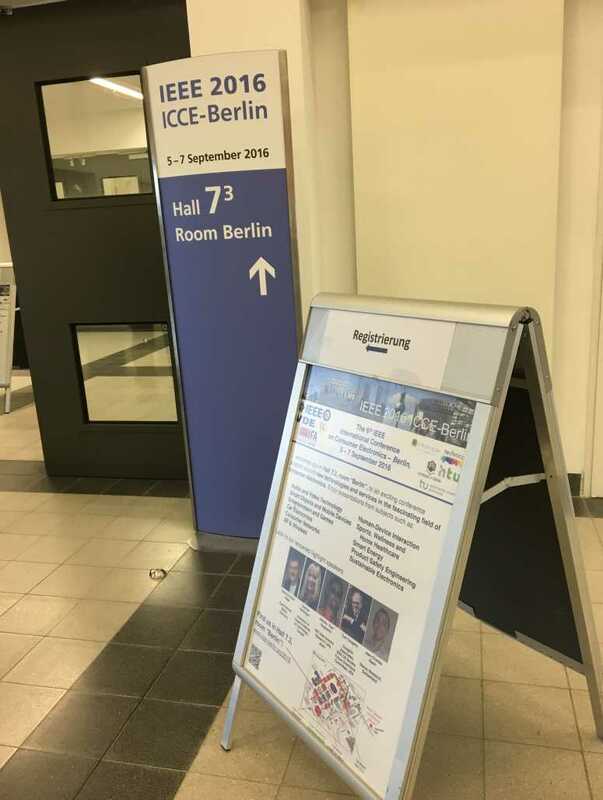 Carlos R. del Blanco from the Grupo de Tratamiento de Imágenes at the UPM, attended the 6 th IEEE International Conference on Consumer Electronics ICCE-Berlin and presented the paper called "Fast Image Decoding for Block Compressed Sensing based encoding by using a Modified Smooth l0-norm". A faster reconstruction method for Block Compressed Sensing encoding is proposed, keeping a similar quality than other state-of-the-art algorithms. The authors and affiliations are: Xiao Jieqiong (Beijing Institute of Technology), Carlos R. del Blanco, Carlos Cuevas, Narciso García (Grupo de Tratamiento de imágenes, ETSI Telecomunicación, Universidad Politécnica de Madrid).